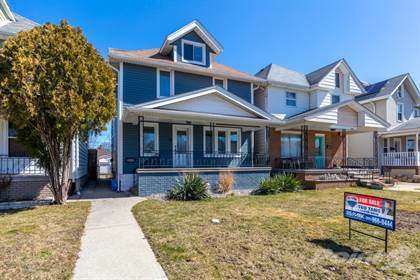 THIS BEAUTIFUL 2.5 STY HOME IN OLDE WALKERVILLE IS SURE TO IMPRESS. WELL KEPT AND METICULOUSLY UPGRADED INSIDE AND OUT, LRG FOYER, FORMAL LIVING RM AND DINING RM W/HARDWOOD FLR, UPDATED KITCHEN, ANOTHER DINING RM/EATING AREA OFF KITCHEN. UPSTAIRS FEATURES 3 LRG BDRMS AND A FULL BATH, 3RD LVL LOFT IS FINISHED AND CAN BE EXTRA FAMILY RM OR PLAY RM. BASEMENT FINISHED W/FAM RM, SUMMER KITCHEN, AND 3 PC BATH, NEW FLOORING, NEW BACK FLOW VALVE AND SUMP PUMP. DETACHED GARAGE ON THE BACK W/NEW GARAGE DOOR, ONE PAVED CONCRETE PARKING ON THE SIDE, RECENT UPDATES INCLUDING ELECTRICITY, PLUMBING, SEWER, VINYL SIDING, DOORS, LIGHT FIXTURES. Hi, I'd like to find out more information about 1048 Moy. Thanks so much!